Xinjiang (Eastern Turkestan) is China’s biggest province. The musical landscape here is one the world’s richest. 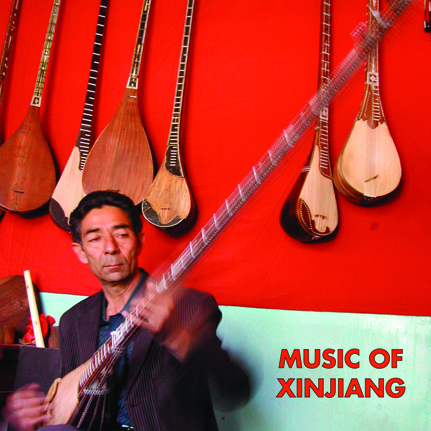 The UYGHUR and the KAZAKH are the two main ethnicities represented on these recordings made by LAURENT JEANNEAU and SHI TANDING in June of 2009. The Kazakh (nomadic) and Uyghur (agricultural) have multiple linguistic ties. Much of this music shares many influences from the Arab world, Turkey and Persia. The sound is that of the Islamic tradition stretching from Turkey to the most eastern frontier of the Chinese empire. These recordings and performances feature some of the area’s greatest musicians playing instruments like the Satar, Tanbur, Adengr, Rawab, Rushtar, Dongbra among many others. These tracks represent ecstatic examples of the region’s rich musical voice. Buzzing plucked strings, and epic tales of the life and legacy of one of the oldest (2500 years) and richest cultural areas of central Asia. LIMITED ED. LP comes with full-size insert of text and photographs by the compiler Laurent Jeanneau.